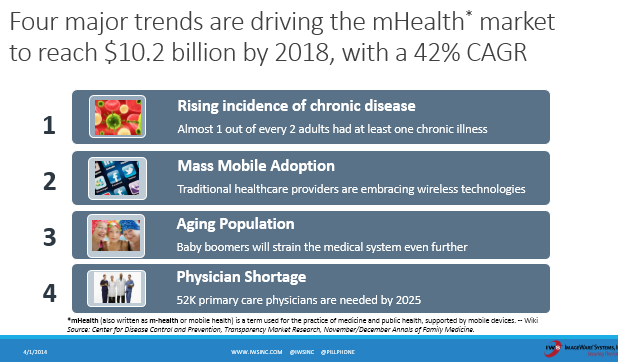 To talk about mHealth, let me start with some quotes from the 2013 mHealth Summit in Washington, D.C., which is the largest event of its kind. mHealth summit brings together technology providers in government, private sector, industry, academia, and not-for-profit organizations from across the healthcare ecosystem to advance collaboration. As the title indicates, it is mainly focused on the use of wireless technology to improve health outcomes. 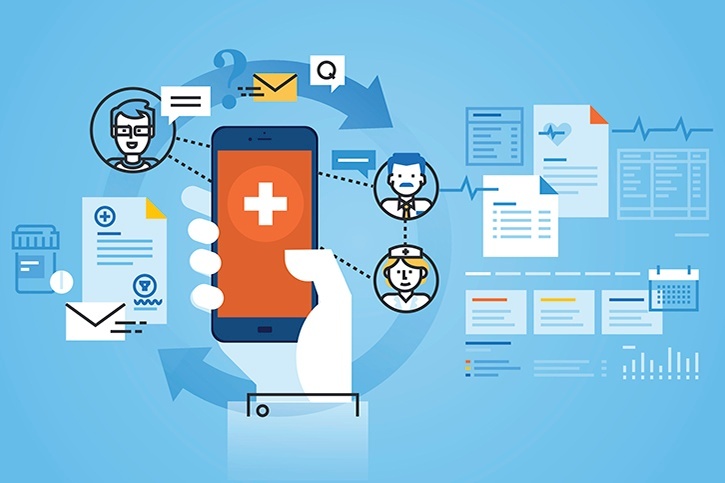 Mobile Health, or mHealth, refers to the broad context of patients, medical providers, and researchers that are leveraging the combined capabilities of smartphones and mobile devices, together with cloud, and global connectivity to deliver improved healthcare. We saw many different estimates on the size of this market. Some of the most reputable resources such as GSMA and Business Insider estimate this market will be a $10 Billion plus business in 2018. As stated in the table above, I have identified four major trends that are driving the mHealth market and today, I would like to add one more to the list: how providers get paid. Traditionally, hospitals and doctors are paid for each service or procedure performed on a patient and the number of hospital beds that remain occupied. The new Affordable Care Act (ACA), as I understand it, rewards preventative care, outpatient recovery, remote monitoring, and care coordination. Basically, providers get compensated for making remote healthcare accessible to patients. This is where the mHealth momentum will likely keep rising. Use cases I can think of are: patient health monitoring, patient communication, medication compliance, even clinical research recruiting. All of these can and will be done remotely. With mobile technology, doctors can diagnose, monitor, treat and communicate with patients at a whole new level. 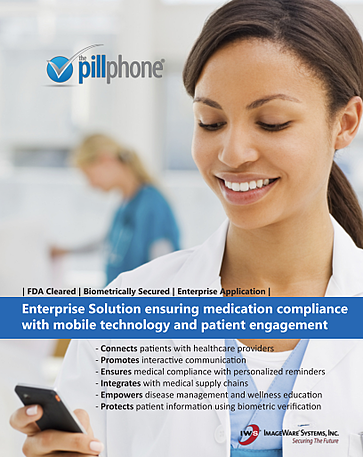 Furthermore, mHealth provides easy, at-finger-tip solutions that put the patient in the center, surrounded by the entire healthcare ecosystem, from drug development to prescription management, and to medication compliance. In other words, mHealth directly meets the demand of the patient-centric requirement of the healthcare industry. According to Gartner, despite growing interest, most deployments of mobile health monitoring are still piloting projects. Lots of education is left to be done, e.g., for HDO (Healthcare Delivery Organization). They are not convinced that the business case for mobile health monitoring is viable, and have not shown organizational commitment to develop sustainable services on a large scale. Gartner also predicts that during the next 5 to 10 years, while mHealth monitoring evolves and its clinical uses become more clearly defined, this market will likely fragment into certain sub-segments focused on different areas, such as obesity, chronic obstructive pulmonary disease (COPD), diabetes and cardiac care. In summary, the key business benefit that mHealth can bring, if deployed appropriately, is that it will enable closer monitoring and faster intervention in the care of certain groups of patients. It will improve patient engagement, enhance the patient experience and increase adherence to care plans.